I'm nearing the end of a series. It's a misty-eyed time for me, because I've put a lot of myself into these books. As far as I know, putting a lot of yourself into your stories is the way to write the best tales possible. If someone knows an easier way, I'd be glad to hear it. In recent years, instead of typing The End when finishing a manuscript, I use The End...or is it The Beginning? I love this change. After all, don't we all want our favorite characters to have more happily-ever-after than is seen on the page? It's all in the point of view, isn't it? 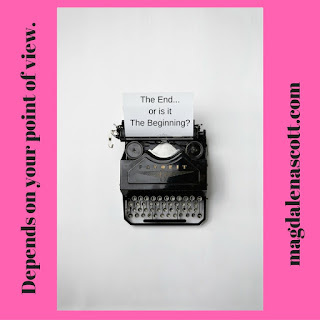 End of a series, or beginning of new opportunities? End of summer and super hot weather, or... Okay, I'm not going to try to predict that. Ouch. Make mine long series, all the way! Hi, Jean. Thanks for your vote! Is there such a thing as too many books in a series for you? I love a long series, but I also love stand-alone novels. And to answer your question to Jean, there's never too many books in a well-written series. Guess that shows I'm an avid reader. I think trilogies are my favorite length for a series, but I wouldn't hesitate to read a longer series. I like long series, short series, and stand-alone. I'm a reader to my marrow, so I'll take whatever I can get. 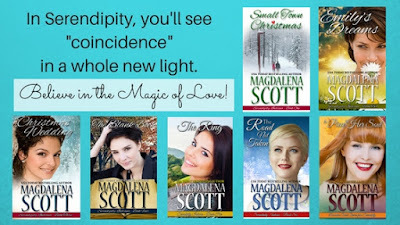 :) Loved your post, Magdalena! Hi, Donna. Right, there's nothing like getting lost in a great book! If I've fallen in love with the characters and setting, I don't want a series to ever end - so long is awesome! I also like short series and stand-alone books, too. Great post, Magdalena! Hi, Shanna. Thanks for your input. I have felt that way about some long series, too.